As the game opens up, you'll be traveling with a caravan -- until you come to a downed tree, and then you'll be camping with a caravan (#1). When the caravan stops, Odema the caravan master will notice that you look sick, and he'll recommend that you drink a tea made from water and Springberries. He'll then send a scout named Sparfel to look for water, while he pairs you up with a fighter named Calisca to look for berries. You'll find Springberries in the northwestern part of the map (#2). You'll have to defeat a Young Wolf to get to them. After picking up the berries, Calisca will suggest that you check up on Sparfel. You won't catch sight of him, but you will see his waterskin on the other side of the river (#3). When you pick it up, you'll automatically fill it to create a Full Waterskin, but then Sparfel will come stumbling back, dying from an arrow wound, and you'll get attacked by two Glanfathan Hunters. 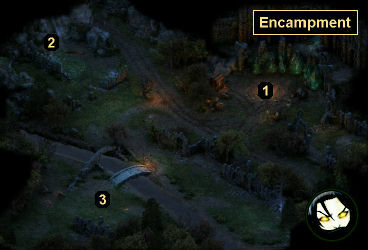 After the battle, you should return to the camp (#1). Along the way, you'll get attacked by three more hunters. Then inside the camp, you'll discover that just about everybody else from the caravan is dead, except for Heodan the merchant, who you'll find in the clutches of the Glanfathan Leader. No matter what you say, Heodan will get wounded, and you'll have to fight the remaining Glanfathans. Your dialogue will only change whether Heodan receives a "bruised ribs" injury or not. Taking the Intellect 15 / Lore 1 dialogue option will prevent the extra damage. Note: If you lay down your weapons, then you'll have to fight the Glanfathans unarmed, so don't do it. When the battle ends, a biawac will blow into the camp, and you'll be forced to flee into the ruins that the Glanfathans were protecting. However, Heodan will lag behind you. If you sacrifice your weapon or have at least Dexterity 15, then you'll be able to save him. Otherwise, he'll be killed by the biawac. Regardless, entering the ruins will complete the quest.